If you love sitting around a campfire, you are going to really appreciate the thought that went into the ‘Campfire in a Can’. The designers (true camping lovers) wanted to create a hassle free campfire that was easy to set up, use and dismantle. The result is truly impressive and lets campers concentrate on enjoying the fire without worrying about anything else. The inventors put a lot of effort into a fire that burns and heats well. The design of the Can is such that there is ideal airflow which provides a perfect fire and also, since the wood is placed vertically, heat is distributed to the sides, warming everyone around. 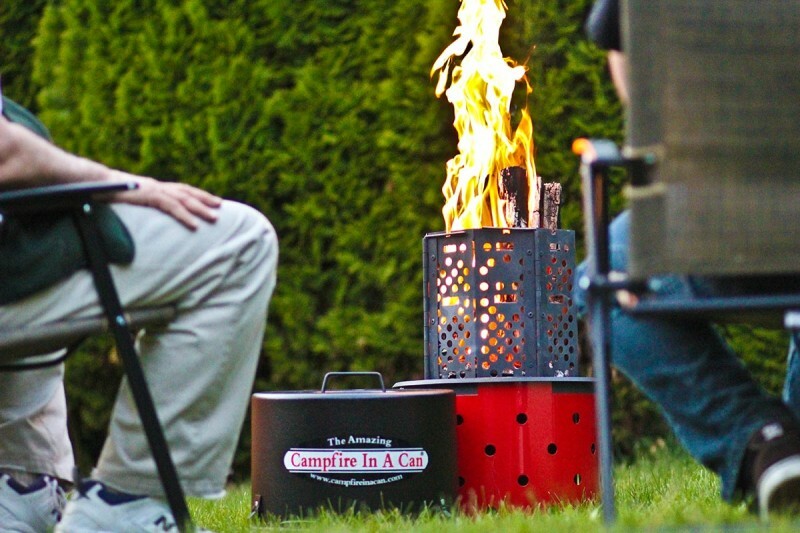 Using the Can, you can light up a wood, charcoal or propane fire in no time. (The propane tank is separate but is recommended since you can enjoy a fire in places that might restrict live fires.) You can easily convert between the energy sources making cooking and then sitting around the fire a snap. A key concept of the Can is an ‘all-in-one’ solution. Everything you need is neatly packed in the Can so you never have to worry about missing pieces. The Can contains all of the cooking utensils and once you have finished with the fire you can easily extinguish it using the lid. The dimensions of the Can (with the Propane Kit are) 17″ x 17″ x 14″ and its weight is 25.6 lbs.